It is irrelevant how I ended up staying at a ritzy hotel in New Jersey back in March of 1990. Suffice it to say, I was sick with a head cold and was ordere by a doctor not to fly back to California. My first night on the East Coast had been spent in a chain motel without incident. So I was very sick with a severe head cold, sore throat and fever when I checked into the Victorian era, ivy -covered stone building. I was dizzy and fatigued and craved soup and sleep. I was sharing a room with my mother. As we made our way down the corridor, I noticed the Laura Ashley motif covered everything from the walls to the seat cushions to the comforters on our beds. I ordered room service: duck wonton soup and lemon- lime soda for my throat. I took a hot shower, put on my pajamas and crawled into bed. My mother was concerned, but let me be. The doctor had explicitly told my mother I was not to fly for another four days. My step father was coming to meet us after attending a conference in Boston, which meant I had to move into my own room down the hall. I was scared. I told my mother ” this hotel is haunted.” She laughed at me. My new room in the hotel was decorated exactly like the first one; patterns of blue peonies and pink carnations were everywhere. My mother had told me I could order room service and watch cable T.V. News of the tragic Happy land Dance hall fire in Brooklyn, which killed several dozen people, was splattered on all the stations. I kept going back to watching music videos to forget what had happened the night before. Maybe it had been a bad dream. Tonight would be better, I told myself. I turned off the T.V. and then the lights. I don’t know how long I had been asleep when I awoke to find yet more women with the same night gowns in my room. I quickly turned on the lights & the T.V. Splashing water on my face , I realized the next few ays were going to be rough. There was no way I was going to be able sleep without the lights on. I asked someone in the hotel if the place was haunted. They just shrugged. I vowed that one day I would find out the truth. Maybe I could discover it in Public Records, some kind of history of the building before it was a hotel. These were the days before the Internet . The incident never left my psyche. Someday. Someday. Several years later I moved to the East Coast. I was living in Philadelphia and was at a church rummage sale. I noticed two older women who appeared to be in their early seventies sitting in a corner of the room. I went over and sat next to them. They smiled and said hello. I asked them where they lived. They mentioned the town where the hotel was located. I asked them if they had heard of the hotel. They nodded. I paused, unsure if I should tell them the story. But I knew what I had experienced had not been the result of a feverish head cold or a common nightmare. I expected laughter to erupt. Instead the faces of the women had a look of compassion and kindness. “We believe you” they said in unison. The hotel had been a residence for homeless and mentally ill women at the turn of the Century. As they shared the history of the hotel, I felt myself go pale and my legs started to shake. Since that time, I occasionally google the hotel to see if anyone has mentioned if it is haunted. No on has. I toy with this idea of going back for an overnight stay at the hotel. 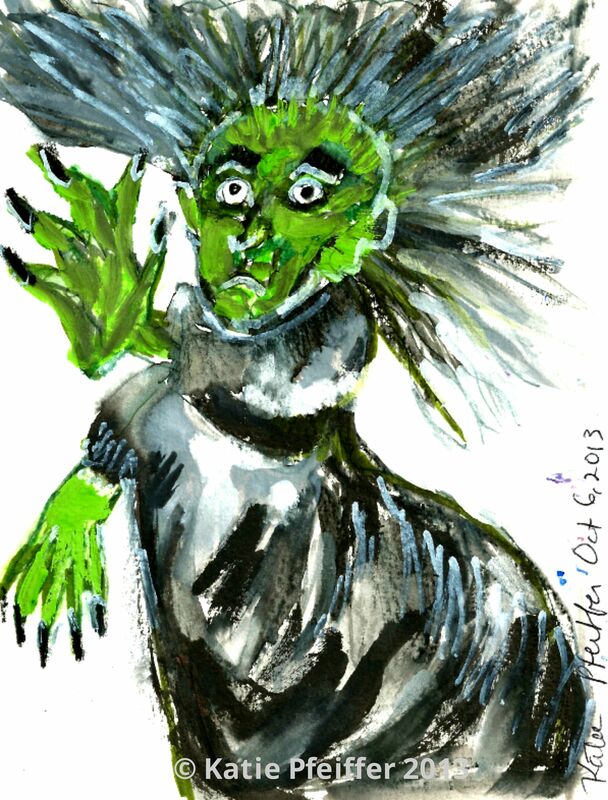 A few weeks ago, I created a series of witch paintings I dubbed THE PENDLE HILL WITCHES. 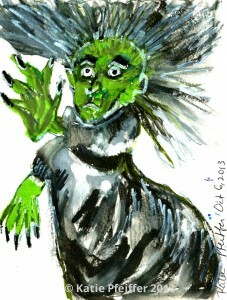 The last witch- witch number ten closely resembles the apparition who tried to smother me with a pillow.